In 2013, the first full year of Tamara Rojo’s artistic direction, I saw English National Ballet’s Alison McWhinney and Ken Saruhashi in the Emerging Dancer Award. Almost six years later to see McWhinney take on the title role of Manon in ENB’s revival of Kenneth MacMillan’s work with Saruhashi as her brother Lescaut is one of the many privileges of seeing and writing about dance over a number of years. Although it was Nancy Osbaldeston who won the award that year, I wrote at the time that ‘My heart went out to Alison McWhinney, whose ethereal tenderness in Giselle — she will save many a young man from an early death and will make them all eternally repentant — and her lovely line and poise in Victor Gsovsky’s Grand Pas Classique are a joy to watch.’ The arc of McWhinney’s artistic sensitivity arguably extends to the final act of Manon where having played all her demi-monde cards Manon finds herself in a redemptive endgame with the ever-faithful Des Grieux (Francesco Gabriele Frola). McWhinney casts aside all risks in this demanding duet and receives from Frola the unbridled passion and devotion of an equally liberated partner. It is utterly thrilling and deservedly brings the house down. For Frola this final act of Manon follows a fine thread of characterization — and its technical counterpart — throughout the ballet. He takes the elegance of MacMillan’s choreography and makes his character and reasoning grow naturally out of it; the coherence of his interpretation remains as lucid as the line of his arabesque. It is McWhinney who in those first two acts does not entirely enter into the complexities of Manon’s character, which in turn hampers the freedom with which she approaches her interpretation of the choreography. The final act shows what she can do when the emotional line is clear, but she has not yet embodied the mercurial changes in circumstance Manon faces — and their inherent contradictions — between the prospect of a nunnery, Des Grieux’s love and Monsieur GM’s cloying wealth. At the same Emerging Dancer Award in 2013, I noted that ‘Saruhashi has prodigious technical ability but wears his emotions close to the skin, giving an impeccable if somewhat inscrutable rendering of Don Quixote and unwinding only slightly in the all-too-brief Patrice Bart solo, Verdiana.’ It is interesting to see these qualities persist in his interpretation of Lescaut. Dressed in black he stands out as someone already deeply inured in the demi-monde and cynical enough to pimp his own sister. He is sharp and calculating, drawing in his power like a sword but when it comes to his drunken cavorting solo he can’t unwind enough to blur the edges of his technique; he approaches it with too much…calculation. It may be invidious to suggest a comparison but Irek Mukhamedov’s interpretation of this solo — seen online in rehearsal — illustrates just how a prodigious technique with fine comic and musical timing can be married to drunken intent. Among some fine character roles like Michael Coleman as the Old Man and Fabien Reimair as the Gaoler, there is another interpretation that illustrates Stanislavsky’s maxim that there are no small parts. Francesca Velicu (a finalist in the 2018 Emerging Dancer Award) is one of the courtesans at Madame’s house of ill repute in the second act. It is a stage awhirl in pastel colour and racy activity, but Velicu’s inspired antics among her peers attract attention throughout the melée like light on a filigree pattern, drawing us away momentarily from the main characters before we focus once again on their primary narrative. This is exactly how anyone in the room at the time (and we are all there) would experience the breadth of the moment. 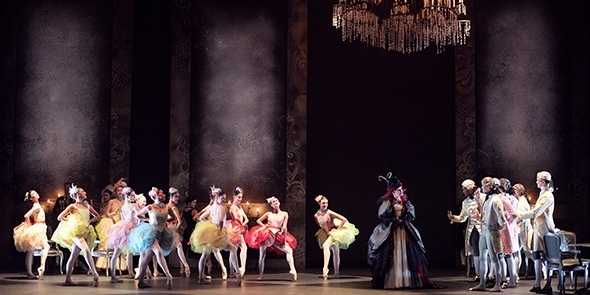 While the choreography in this revival of Manon is all MacMillan (rehearsed by some of the luminaries with whom he worked), the sets and costumes belong to the Royal Danish Ballet’s production designed by Mia Stensgaard. While one had the sense that Nicholas Georgiadis’ original sets were performing alongside the cast, Stensgaard has a more subtle approach, abstracting the scenes with gently moving panels that furnish just the right amount of period suggestion to go with her elegant wigs and finely tailored, colourful costumes. It’s a stylishly minimal production that frames the dancing beautifully while Mikki Kunttu’s cinematic lighting makes the space of each successive scene almost palpable. The English National Ballet Philharmonic under the baton of Orlando Jopling make listening to Martin Yates’ arrangements of Jules Massenet’s music as much a pleasure as watching the ballet.